Dr. Joseph Martino provides his patients with progressive and comfort-conscious dental care. Your best interests are our primary concern. We provide a wide array of state-of-the-art dental procedures to ensure each patient receives treatments tailored to their needs. Our quality services include periodontics, implant restoration, bleaching, fixed and removable prosthetics, endodontics, Invisalign® clear aligners, CEREC® one day restorations, and Snap-On® restorations. We also specialize in working with phobic and physically disabled patients, and offer I.V. sedation when needed. 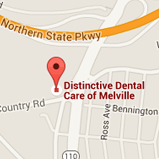 Distinctive Dental Care of Melville has built a reputation as a friendly, professional, family oriented, and upscale practice where patients receive exceptional care and a relaxing experience. Our office has a modern, warm and friendly atmosphere. Dr. Martino only treats one patient at a time and treats everyone as a friend. Your best interests reign supreme in our practice. We care about your health, well-being and comfort. We want to exceed your expectations and give you a smile you can be proud of. Contact our Melville dental office for a complimentary consultation. We will give you a tour of our facilities and will speak to you about your oral health. We want you to have a positive dental experience at every visit. Call us today to join our family of patients! Serving Melville, Huntington, Plainview and Dix Hills, NY — Dr. Joseph Martino is your comprehensive dentist, offering dental care for children, teens, and adults.